This is the guide you’re looking for. Believe me when I say: you need this book in your life. It is the most complete guide to fan-geekery I have ever read, and I finished it feeling proud of my quirks and fandoms. It was complete and gorgeous, and I think it may need the tagline ‘A reference for the rest of us‘ on the outside, because I am certain that everyone, not just the fangirl, would benefit from reading this book. So what is this guide? What does it guide you to? What’s in it that makes it so special? Well, first of all, let me address the fangirl who’s wondering why she even needs a guide to the galaxy. For starters, you probably don’t need a guide, because let’s face it, you’re awesome, and you’ve made it this far, right? But this guide is special. Because for once, it’s a guide with you on its mind. You’re the one it’s written for! That was a big first for me: it’s rare to get good books for the female geek. It’s tailored to your needs. Which is pretty dang cool. That alone doesn’t mean you need this book, so just listen to what the guide actually contains. 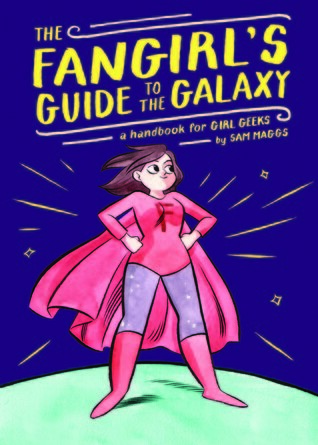 It’s basically an encyclopedia of geek terms, an overview of major fandoms, fabulous advice for everything from dealing with Trolls to having the best time ever at Con, interviews with kick–s successful ladies that we love, and resources for finding great places on the internet. The interviews were a great touch: the women interviews are writers, artists, geeks who have really put their names out there, and their input is fantastic. It’s a reminder as to why being a fangirl is something to cherish. Many of these women are already personal inspirations to me, pushing me to follow my dreams (as cheesy as that sounds) and reading their thoughtful words just makes me love them more. You go, girls! However, I feel like while this book is aimed towards us fangirls, it’s a great resource for the people around us. I think my mother might gain a better understanding into how I spend my time if she were to read it. My father might understand what I’m talking about when I start using ‘internet vernacular’. My non-geek family could gain a better respect for the culture of my community. Yes, a lot of the terminology defined is something a fangirl would have picked up even on her first day on the internet. But that’s why I feel like it’s slipped in for the benefit of the others, as a way to invite out family and friends into the fold. And what a great way to do that! It gives us a starting point to build off when we want to share our love of all things fandom with our actual loved ones. The greatest thing that comes from this book, however, I think is the empowerment. The validation. The guide reminds us that we should be proud of what we chose to love, that we will not be held down because of it. It is inclusive of everyone (not just fangirls) and supportive of all interests. It offers resources against online bullying and anything that can be thrown at you out IRL. This is why the Guide is not simply a guide. It’s got a bit of something for everyone, and everyone will love it. Expect it on May 12.